Henry Holiday (17 June 1839 – 15 April 1927) was an English historical genre and landscape painter, stained glass designer, illustrator and sculptor. He is considered to be a member of the Pre-Raphaelite school of art. Holiday was born in London. He showed an early aptitude for art and was given lessons by William Cave Thomas. He attended Leigh's art academy (where a fellow student was Frederick Walker) and in 1855, at the age of 15, was admitted to the Royal Academy. Through his friendship with Albert Moore and Simeon Solomon he was introduced to the artists Dante Gabriel Rossetti, Edward Burne-Jones and William Morris of the "Pre-Raphaelite Brotherhood". This movement was to be pivotal in his future artistic and political life. In that same year, 1855, Holiday made a journey to the Lake District. This was to be the first of many trips to the area, where he would often holiday for long periods of time. Whilst in the Lake District, he spent much of his time sketching the views which were to be seen from the various hills and mountains. He wrote, "For concentrated loveliness, I know nothing that can quite compare with the lakes and mountains of Westmorland, Cumberland and Lancashire." "The Burgess of Calais" (1859). "The Rhine Maidens" (1879). The subject matter was taken from Wagner's opera Das Rheingold. In order to properly visualise the picture, Holiday modelled the 3 Rhine maidens in clay and placed them in a tank of blue-green tinted water together with clay "rocks". 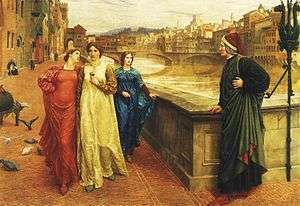 "Dante and Beatrice", exhibited at the Grosvenor Gallery in 1883. In 1881, Holiday had travelled to Florence in order to make studies for this picture, and carried out meticulous research to ensure that the correct buildings and architectural features were present. He also created rough clay models of some of the buildings to set the scene. The pigeons in the picture were painted by John Trivett Nettleship. 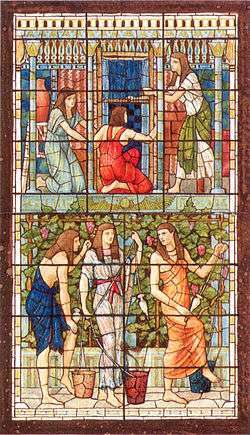 "Charity", a stained glass window design (1887, Royal Academy), "Terpsichore", "Cleopatra", "Sleep", "The Lute player", "The Temple of Philae", "Hawes Water" (1918, watercolour) and many others. Holiday spent a lot of time at the studios of Sir Edward Burne-Jones, where groups of artists would meet to discuss, exchange and pool ideas. The influence of Burne-Jones can be seen in Holiday's work. In 1861, Holiday accepted the job of stained glass window designer for Powell's Glass Works - after Burne-Jones had left to work for Morris & Co. During his time there he fulfilled over 300 commissions, mostly for customers in the USA. He left in 1891 to set up his own glass works in Hampstead, producing stained glass, mosaics, enamels and sacerdotal objects. Holiday's stained glass work can be found all over Britain but some of his best is at the chapel of Worcester College, Oxford (c.1865), Westminster Abbey (the Isambard Kingdom Brunel memorial window, 1868), St. Luke’s church in Kentish Town and St Mary Magdalene, Paddington (1869). Hunting of the Snark, plate 1. Holiday also did some sculpture, in 1861 producing a piece called "Sleep" which attracted favourable critical interest. Holiday worked for architect William Burges for a period, including providing wall and ceiling paintings for Worcester College, Oxford (1863–64) and furniture paintings - including "Sleeping beauty" for the headboard in the bedroom of Burges's home The Tower House itself. The "Sleeping Beauty" bed is now in the collection of the Cecil Higgins Art Gallery & Bedford Museum. Holiday has four oil paintings in British national public collections. In October 1864, Holiday married Catherine Raven and they moved to Bayswater, London. His wife was a talented embroiderer who worked for Morris & Co. They had one daughter, Winifred. In 1867, Holiday visited Italy for the first time and was inspired by the originality of the Renaissance artists he saw on display there. In 1871 he went to Ceylon as part of the " Eclipse Expedition". His astronomical drawings were subsequently published in the national press and attracted great interest. On his return to England in 1872, he commissioned architect Basil Champneys to design a new family home in Branch Hill, Hampstead, which was named "Oak Tree House" - in 1888, William Gladstone himself was a visitor. In January 1874, Holiday was commissioned by Lewis Carroll to illustrate The Hunting of the Snark. He remained friends with the author throughout his life. In 1907, Holiday went to Egypt, painting a series of watercolours and illustrations on ancient Egyptian themes. These were exhibited at "Walker's Gallery", London, in March 1908. In 1907-08, he commissioned the building of a holiday home, Betty Fold in his favourite part of the Lake District. Between between 1912 and 1919 he painted the apse of the east end of St Benedict's Church at Bordesley, Birmingham, depicting Christ in Glory with angels, and saints in arcading, below, in Byzantine-style. Holiday had been a socialist throughout his life and, together with his wife Kate and daughter Winifred, supported the Suffragette movement. The family were close acquaintances of Emmeline Pankhurst and her daughter, and had organised local suffragette meetings in the Lake District. Holiday died on 15 April 1927 in London, two years after his wife, Kate. His nephew, Gilbert Holiday (1879–1937), son of Sir Frederick Holiday, was also an artist who also has paintings in British collections. Henry Holiday: An artist's album (Courtauld institute). ↑ "The Burgesses of Calais by Henry Holiday :: artmagick.com". ↑ Various. Famous Paintings, Volume 1 (Cassell, 1891), no. 1. ↑ Geoffrey Tyack. "Oxford: an architectural guide" p226. 1 2 Short biography (Lewis Carroll Society). ↑ Simeon Solomon in Italy for more details. ↑ "Exhibition Culture: title text". ↑ Historic England. "Details from listed building database (1076300)". National Heritage List for England. Holiday, Henry. Stained glass as an art (1896). Holiday, Henry. Reminiscences of My Life (Heinemann London, 1914). Carroll, Lewis. The Hunting of the Snark an Agony, in Eight Fits (London: MacMillan & Co., 1876). Various. Famous Paintings, Volume 1 (Cassell, 1891), no. 1. Mackay, Angus M. Henry Holiday and his art. Article from The Westminster Review, Volume 158 (1902) pp. 391 ff. The decorative work of Mr. Henry Holiday (Studio International, Volume 46, 1909) pp. 106–115. Baldry, A. L. Henry Holiday (Walker's quarterly, nos. 31-32, pub. by London: Walker's Galleries, 1930). Henry Holiday 1839-1927, exhibition catalogue (London: William Morris Gallery, Walthamstow, 1989). Wilcox, Scott & Newall, Christopher. Victorian landscape watercolors (Hudson Hills, 1992) p. 190. Cohen, Morton N. & Wakeling, Edward. Lewis Carroll and his illustrators (Macmillan, London, 2003) pp. 22–27. Wikimedia Commons has media related to Henry Holiday.